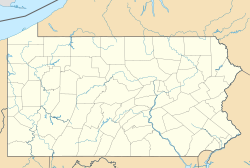 Ingleby is a ghost town located in Haines Township, Centre County, Pennsylvania, United States. Near Coburn along Penn's Creek and surrounded by mountains, Ingleby was once a flag station on the Lewisburg and Tyrone Railroad. Lumber and lumber products were carried out of the mountains and railroad passenger service provided access to this scenic high valley. Dr. Frank Barker erected a large house near the tracks, two miles east of hunting and fishing cottages, and the spot quickly became a popular resort known as Ingleby. The section of railroad passing through Ingleby was abandoned in 1970. Today access is provided by Ingleby Road (State Route 2018, unpaved). It was at one time also named Fowler. It is located just up the road from the Woodward Camp, Woodward Cave, Chilcote Muscle Therapy, The Inglebean Coffeehouse, and the Elk Creek Cafe. Although Ingleby has always been famous for its access to the amazing fly fishing on Penn's Creek, most of the land in the area is privately owned. As one can see by the map the area is bordered by the Bald Eagle State Forest. While it is tempting to bike, hike, four wheel, etc. all over without permission, the roads of Lick Hollow and Rupp Hollow are privately owned and gated from access either from the State Forest OR Ingleby road. They are sufficiently posted to avoid any confusion both by landowners and the State Forest sign at the top of Lick Hollow Road defining it as a dead end. The Bald Eagle State Forest can be entered on numerous roads off of rt 45 and Poe Mountain. At one time a logging community and retreat, not much has changed, as it is a carefully watched over vacation and hunting ground with several year round residents. This page was last edited on 17 January 2018, at 13:38 (UTC).